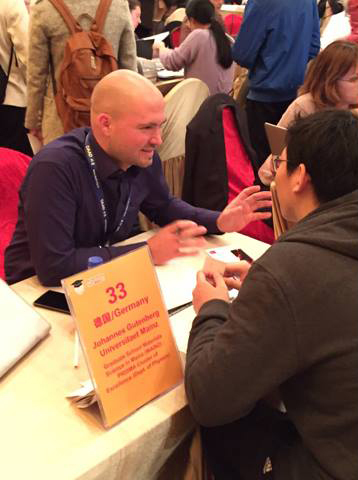 From November 22 to 26, 2014 Dr. Kevin Anding (Cluster of Excellence PRISMA) and Dr. Mark Bajohrs (Graduate School of Excellence MAINZ) went to trip to China and South Korea to recruit international young scientists interested in doing their doctoral studies in Germany. The first location was in Peking from November 22.-23., 2014. Anding and Bajohrs participated in the PhD Workshop China. This workshop is a professional event in China where overseas universities and research schools present their PhD programs and network with the top Chinese postgraduates and PhD candidates. This career event for the placement of highly qualified Chinese doctoral students is organised by the Chinese Education Association for international Exchange (CEAIE). Prior to the workshop the participants were informed about the characteristics of the Chinese educational system. During the workshop Dr. Anding and Dr. Bajohrs promoted the study and science location in Mainz and in particular the graduate programs of PRISMA and MAINZ. Some interesting talks with Chinese master students and graduates led to invitations to apply for the graduate programs. Following the PhD workshop in China a three-day PhD Tour through South Korea took place from November 24 to 26, 2014. This PhD Tour was organised by the DAAD as well to both deepen the relations between the German and South Korean universities and to attract South Korean doctoral students to the German research landscape. The German participants were offered a good insight into the university system of South Korea which is largely marked by the US system. In addition the Mainz representants took the opportunity to glimpse into local laboratories and to talk to South Korean scientists doing research in the fields of PRISMA's and MAINZ's research program. 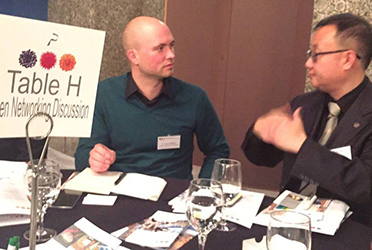 The PhD Tour ended with a networking round and last discussions with South Korean young scientists.